The second round of fixtures in this week’s double header is nearly upon us and there is no time for the teams involved with the Tuesday night action to rest or recuperate. 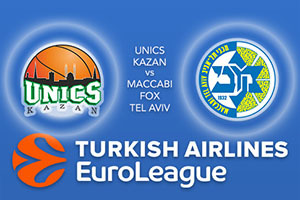 Thursday night sees another four games taking place in the Euroleague and the action switches to Russia with UNICS Kazan welcoming the Israeli side, Maccabi Fox Tel Aviv. The hosts hold a 2-5 record coming into Round 8 of the season while away team have a slightly better 3-4 record. Kazan were involved in Turkey on Turkey and they lost out in a high scoring match. Anadolu have found their feet after a difficult start to the campaign and the Turkish side triumphed by a 104-99 score line. The fact that UNICS were an inch away from grabbing 100 points has to be viewed as a positive factor for the team but of course, their defensive shape needs a lot of work carried out on it. it is asking a lot for these problems to be resolved in just two days but you can expect a reason from the home side in this game. Coty Clarke is providing an average of 13.5 points per game this season and he’ll need to deliver on Thursday if his team are going to improve their status. Maccabi come into this game on a high after defeating Fenerbahce 87-77 on Tuesday night. Defeating last season’s Euroleague runners-up is always a big scalp even if the Turkish side have been off the boil in recent weeks. Sonny Weems grabbed 22 points in that victory and he has been at the heart of the positive aspects of the Maccabi squad in recent weeks. Andrew Goudelock is still the leading scorer with an average of 17.7 per game this season but Weems currently holds a record of 16.2. The bookies think this is going to be a very close game. You should look to take UNICS Kazan, who are available at +1, which you can find on offer at odds of 1.90. There is also the Over/Under market available for this game and you should consider going OVER 162.5 which is provided at odds of 1.90 for this Thursday night game in the Euroleague. Bet Now!